All have been permitted by officers using delegated powers. Application to certify that the proposed single storey rear extension and insertion of 1no. window on side elevation is lawful development. Application to certify that the proposed conversion into two self contained flats, provision of cycle parking space and bin storage at ground floor level is lawful development. Erection of water tanks and 2m fence. Demolition of existing outrigger. Erection of a two storey rear extension and formation of 1No. dormer to rear roof slope and insertion of 1No. rooflight to front roof slope to create 2 x 1-bed flats (Use Class C3) . Provision of bin and cycle store. At East Area Planning Committee, Ruth requested that members are alerted when the Construction and Traffic Management Plan and the Student Management Plan are received by planning officers. Please note, it is not agreed or signed off by the planning officer yet. There are two this week for extensions in Gardiner Street and Lime Walk. Please click on Planning applications above to view details. 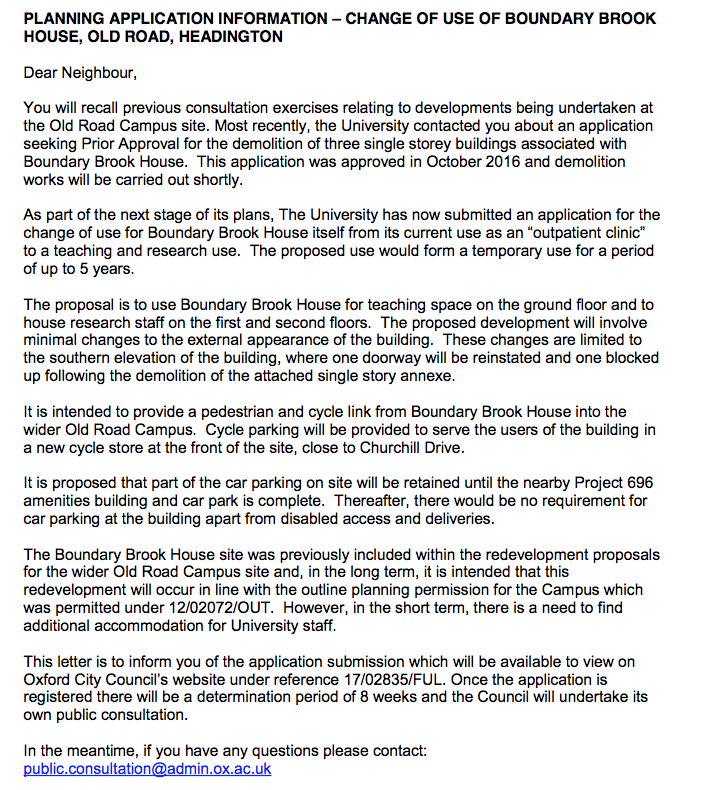 The University has written to local residents and councillors about changes it plans to make to Boundary Brook House. It’s noticeable that applications for dropped kerbs are increasing from properties along the Access to Headington works route. For the latest applications in Windmill Road, Sandfield Road, and Barton Lane, please click on Planning applications tab above. Erection of a 1×1-bed dwelling with parking. Erection of 1 x 2-bed dwelling with parking provision and access. Erection of two modular units outside the minor injuries entrance to provide as assessment facility to reduce waiting times. All the following have been permitted under delegated authority. 17/02009/FUL Demolition of existing entrance hall, WC and rear porch. Erection of single storey front extension. Alteration to windows and doors to the front and rear elevations. 17/02141/FUL Erection of two storey side and rear extension, insertion of 1 window to rear ground floor elevation. Demolition of existing garage. 17/02292/FUL Change of use from dwellinghouse (Use Class C3) to a House in Multiple Occupation (Use Class C4). 17/01496/FUL Affecting a Conservation Area Erection of trellis to the inside of the north and west boundary walls. 17/02368/VAR Affecting a Conservation Area Variation of condition 16 (Sustainable technology) of planning permission 16/02559/VAR (Variation of condition 13 (materials) of planning permission 15/01988/FUL (Demolition of existing chalet bungalow. Erection of a three storey 1 x 5-bed dwellinghouse (Use Class C3). Formation of new vehicular access from Stoke Place with provision of 3No. car parking spaces, bin and cycle store and new landscaping) to enable the use of alternative brick and roof tiles and to allow the condition to be discharged post commencement of works) to allow alternative to a mechanical ventilation system with heat recovery by installing a Flue Gas Recovery Unit. Application to certify that the existing use 1 x 1 bed flat (Use Class C3) is lawful. Change of use of dwellinghouse (Use Class C3) to a House in Multiple Occupation (Use Class C4). Provision of bin and cycle stores. Variation of condition 2 (Develop in accordance with approved plns) of planning permission 16/00131/FUL (Erection of two storey front extension incorporating roof extension and single storey rear extension. Formation of 2No rear dormer windows and insertion of rooflights in association with loft conversion (Amended plans).)) to allow alteration of roof to form hip to gable. Variation of condition 2 (Develop in accordance with approved plns) of planning permission 16/00340/FUL (Erection of part single, part two storey rear extension. Insertion of 1no. window to north elevation.)) to allow the insertion of 1No. rooflight on the North elevation of the rear extension.